Suarez Starting: A Good Start Or Bad? Luis Suarez, the main man of this transfer window and a main player for the Barcelona squad when his ban is ended. The question is will he fit in? Now this ban is a lengthy and tiring one to be honest. Luis will continue as a ST alongside Neymar and have Messi in CAM or have Neymar on the left and Messi on the right. Lets face it those three together as a strike force is like when your friend changes the Fifa squads to have the the best strike force, It still seems unbelievable that them three will be together. Now the big question is will Suarez play to the highest standard and score goals and give assists everywhere? Suarez is always training with the team and will understand how they play. He will try to adapt to the Barcelona way of play but no matter how much you train its just not the same as actually playing a competitive match. This may just effect Suarez. But at the same time oppositely it may just motivate him to play his best and show he does work immaculately and is efficient to Barcelona. Lets be fair though, no matter how great of a player you are if you dont play competitive for while I guess your allowed to have a not so special debut. But IT IS Suarez the guy who missed the first 5 BPL matches last season and still dominated it. I personally believe he will score a goal or two on his debut I mean he'll learn the Barca way in training and maybe click with the ever so important duo, Messi and Neymar. He will be a very important asset as soon as he's back and Suarez will make sure he wont disappoint, his passion for Barcelona is enough to drive us to wins. Check him last season if you have doubts about the guy. You won't after this..
TheSportMatrix • We Live For Sport: Suarez Starting: A Good Start Or Bad? 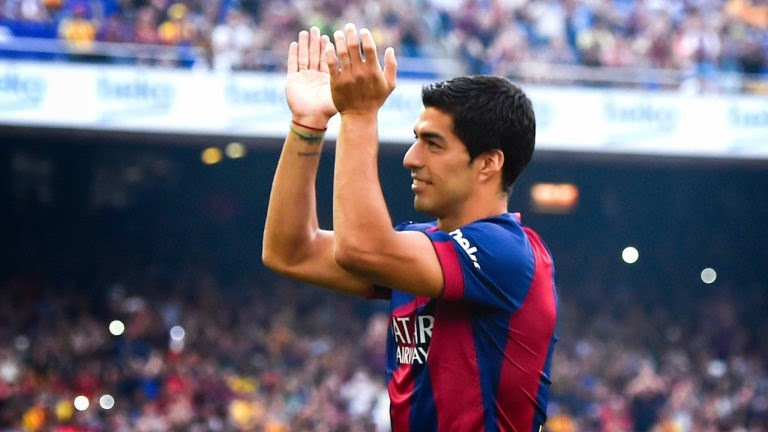 @BarcaAnalysis examines the positive and negative impacts of Luis Suarez featuring in the FC Barcelona starters.